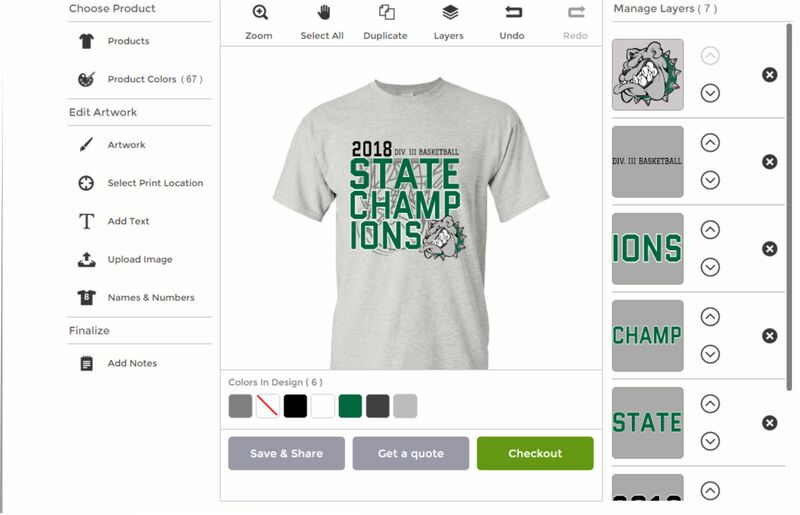 Design your custom t-shirts online. Just because you are ordering t-shirts online doesn’t mean they have to be expensive. At Talkingink.com you can design tshirts online cheap with our new design studio. You can upload your own image, choose from clipart, and even get inspiration from our design ideas. The Design ideas are graphics tha can be customized in both color and text to fit your specific needs. In the 20 years we have been in business we have streamlined our printing processes. So now we are more efficient which saves us time and you money. We go from printing the films to burning the screens to printing your shirts in a manner that is quickly. Through technology what used to take hours now takes minutes. So we spend less time on each order which transfers to savings for you. We now have less man hours per job than before and most other companies in fact. Companies printing 500 t-shirts on a manual press can take a full 8 hour day or more. That’s 8 man hours of printing for one 500 shirt order. At Talkingink Custom t-shirts, that same 500 shirt order now takes around 2 hours from press setup, to print, and press tear down. We are efficient and maximize our time per each job. Another thing Talkingink custom t-shirts does so you can design tshirts online cheap is that everything we do is done in-house. So we have control over the time spent on a job but we also can control the quality. Some of the largest online t-shirt screen printers don’t print all of their orders. So there is a good chance your order is getting printed from a 3rd party printer. So the company you are paying for your custom t-shirts never actually sees your custom t-shirts. When there is a problem or a time sensitive order, good luck getting help. There are so many hands in the pot that the only option is to raise the price of the shirts. Since we do all the printing in-house. We save you money and exceed deadlines.